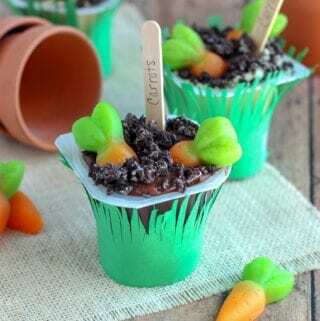 Carrot Garden Pudding Cups are the cutest Spring themed snacks with an easy craft activity. 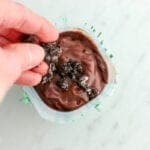 These pudding cups are the perfect spring treat that the kids can make together. 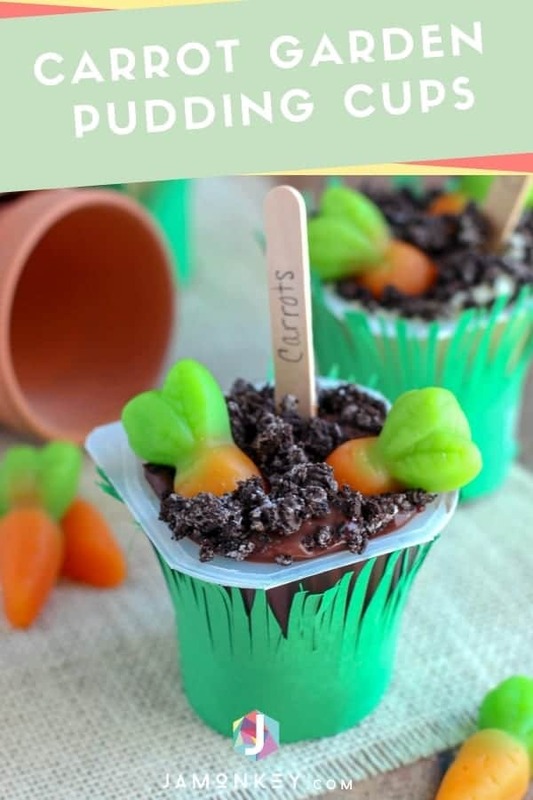 Teachers can do this in their classrooms for a sweet Spring craft and snack. You can find the carrot gummies at the dollar store, they also have them online. Dirt pudding is one of my favorite things to make. Something about chocolate sandwich cookies and pudding that just tastes so delicious. 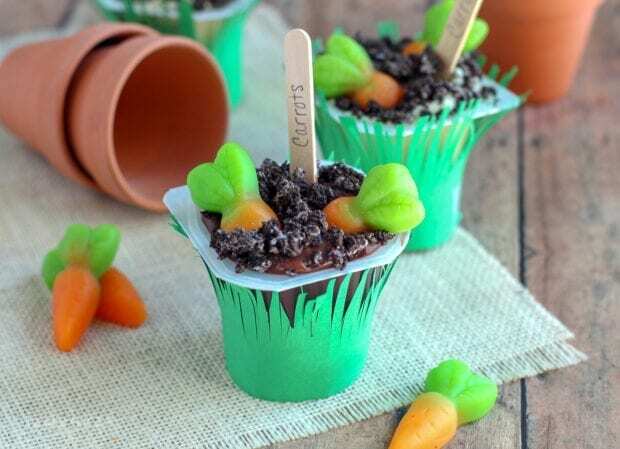 Sometimes adding simple ingredients can turn something as simple as pudding cups into a mini garden. 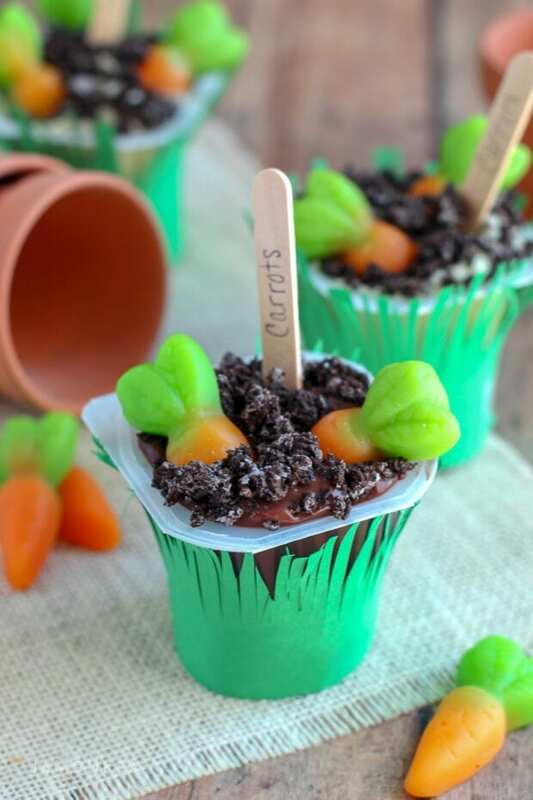 Easy treats make for fun Easter or Spring themed party food. 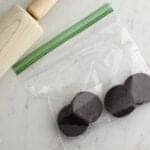 I plan on bringing these to my daughters class for them to make together for snack time. Lay the piece of green construction paper horizontally on a flat surface. 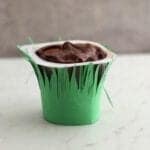 Take one pudding cup and line it up to either the top of the bottom edge so you know where to cut the strip for the grass. It should cover the entire pudding cup. Cut the strip of paper for the grass. 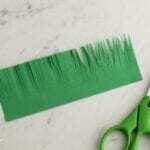 Continue making small cuts about ¾ down the strip of paper to resemble grass blades. I took it a step further and made a few random cuts in between so some of the grass blades had jagged edges. 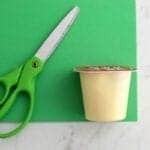 Wrap the strip of paper around a pudding cup (grass blades facing up), then trim to fit and add a piece of tape to secure it in the back. 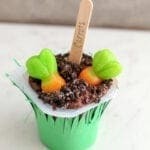 Add a few carrots to each pudding cup - allowing the orange part of the carrot to be partially buried into the pudding. These are adorable! I love them so much.